IRONMAN UK is pleased to announce that there are only 150 slots left for the IRONMAN UK Triathlon in Bolton on August 1st 2010. The 2010 IRONMAN UK will take in more of the stunning Northwest than in 2009, with the Swim now taking place in Wigan. IRONMAN UK is working hard with local partners in the area to ensure some truly unique and stunning viewing options. In a move from 2009, the transition areas will now be on hard standing surfaces and allow spectators more access to their athletes than ever before. The bike course will once again focus on Sheep House Lane and offer an incredible challenge to the athletes who sign up. The hill must be faced three times and last time up, there are no smiling faces despite the stunning views of the Lancashire countryside. The run section will follow the majority of the same course from 2009 with some tweaks made for easier navigation come race day. Last year the run course was lined with spectators for the majority of the day as the local population really got behind the event. 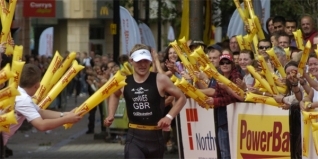 The 2009 stunning finish line will once again be in Bolton Town Centre, with the cheering fans, grandstands and giant TV screen welcoming athletes home after their gruelling journey.